In a city as old as Philadelphia, there's a chance you'll come across something historic pretty much any time you put a shovel into the ground. Philadelphia Water Department historian Adam Levine did some research and found that the pipe was most likely installed around 1812—a time when the Fairmount Water Works had yet to be completed and drinking water was still being delivered via gravity from the Centre Square Water Works, which stood where City Hall is today. 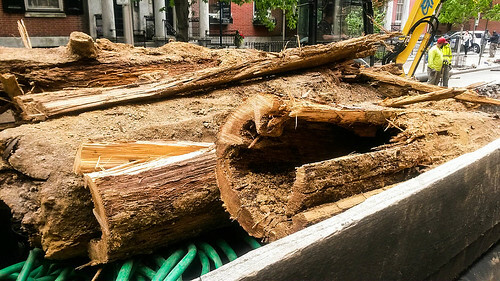 Amazingly, these 205-year-old relics might not have been noticed at all were it not for an observant citizen whom—as luck would have it—had previously heard Levine speak about Philadelphia's water history and seemed to recall learning about wooden water mains. Julie Snell, a Passyunk Square resident, brought the find to PWD's attention by contacting Levine after coming across what seemed to be an unusual scene while riding her bike in Center City. Thanks to her, Levine, and diligent PWD construction engineer Mike Schramm, the old wooden pipes have been saved and stored in a safe location and will be used for educational demonstrations. Since the discovery, this blog post was picked up by newspapers and media outlets all over the country and globe, from the Philadelphia Inquirer and the Washington Post to the U.S News and World Report and the Associated Press. Incidentally, Snell also teaches a class at Temple University called Green vs Gray: Improving and Sustaining Urban Ecosystems, where she often talks about Philadelphia infrastructure, from early water and sewer systems to the Green City, Clean Waters green infrastructure projects happening now. After Levine and Schramm came out to the site and confirmed that the pipes were indeed wooden water mains, Levine began researching old records in the PWD archives. Per his findings, a Watering Committee (an early version of the department that became PWD) report made on Nov. 5, 1812 notes that pipe was laid “Back of Spruce, from Ninth to Tenth” between October 1811 and October 1812, and lists other pipes laid in the same year near this block. "Starting in 1819, the city began laying cast iron pipes as well as wooden ones. After 1832 all new pipe laid was cast iron, and the existing wooden pipes were gradually replaced. The wooden pipe dug up today had been replaced, in 1831, by a 12-inch cast iron main. These replacements continued until 1858, when the last wooden pipe was taken out of service (if not out of the ground). As the photos show, the pipe found today was mostly rotten, but a couple of sections were salvaged and will be moved a storage space." 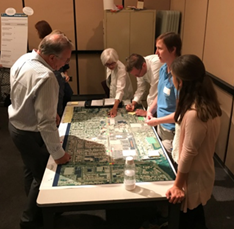 The PWD Archives is dedicated to preserving the history of the department, which began supplying the city with water in 1801. 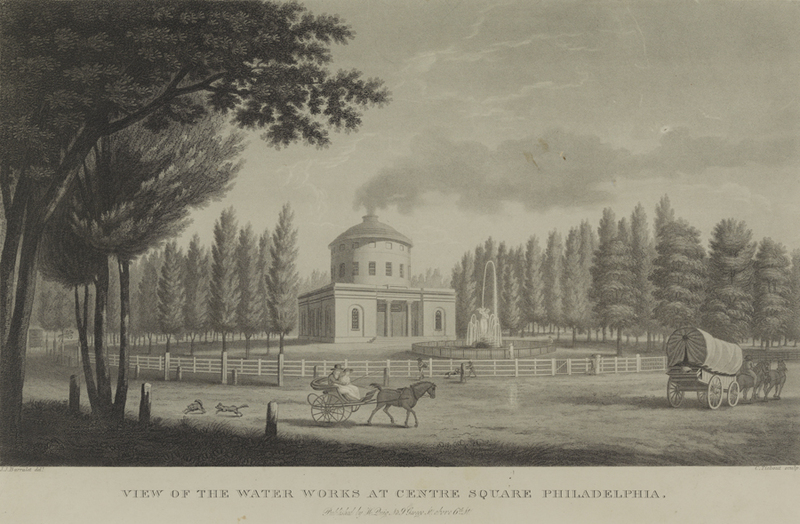 Want to learn more about water history in Philadelphia? 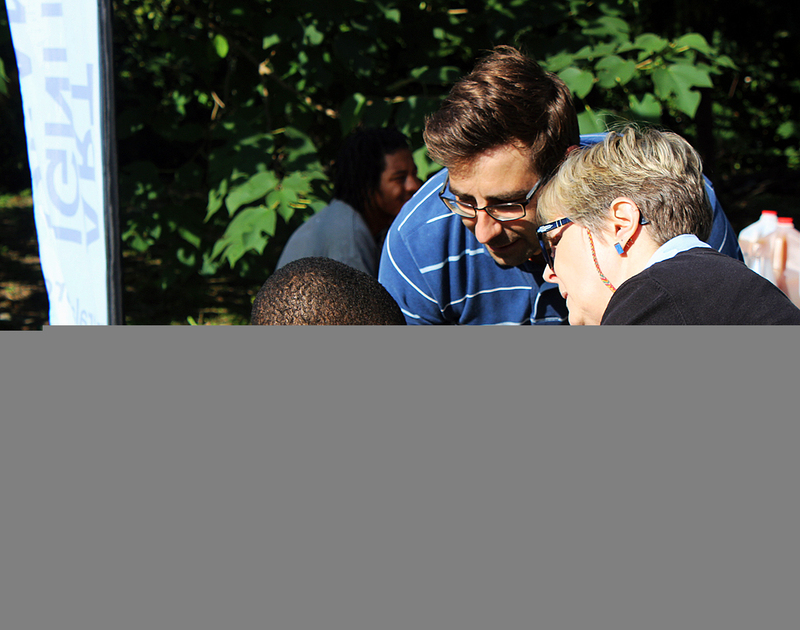 Stop by the City Hall Courtyard this summer for a special (soon to be announced) pop-up installation that will have some information about the Centre Square Water Works, or go to Levine's PhillyH2O.org site, where you'll find troves of information and research.